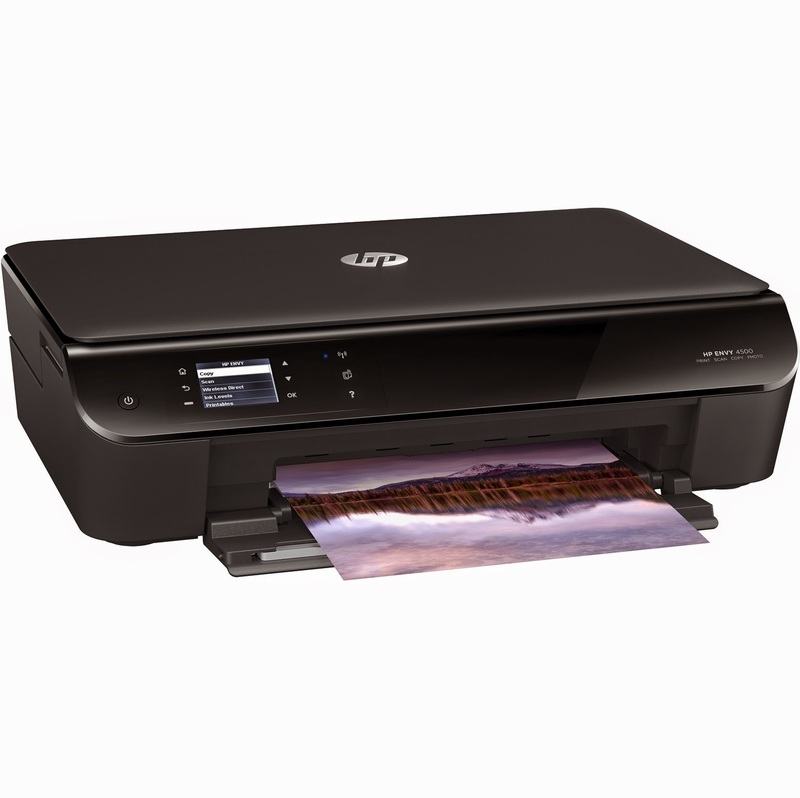 We recently purchased a new all-in-one printer, and signed up for HP's new Instant Ink program. They claim that it can save users as much as 50% on ink. But will it really? . First off, a look at the new printer. It's an HP Envy 4500 all-in-one. A minor selling point - apparently, HP will sell you ink cheaply if you sign up for a subscription. OK, fine. I'm game. But is this really a good deal? This is a good-looking printer/scanner. It's very slim, and it has a paper cartridge that slides underneath the printer's "closed up" footprint. Many printers claim to be compact and small in their specifications, but their "in use" size is much larger, with paper trays that stick out 4-5 inches at all times. Not the Envy - it's as small as advertised. While I'd really wanted a laser printer, and we definitely wanted to add AirPrint capabilities, Ms. AAAD wanted to keep color printing capabilities, and wanted to keep a scanner just in case. 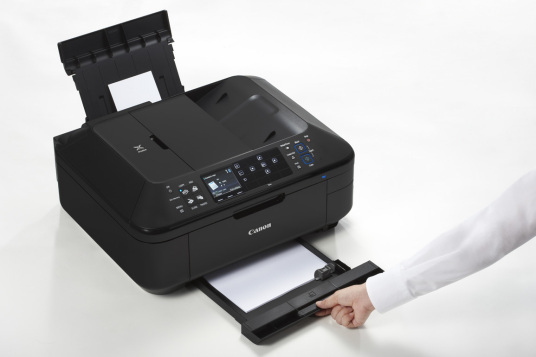 Our Canon PIXMA MX410 had one major advantage - a automatic feeding document scanner. That came in handy a few times over the years, like when we copied the decs and bylaws for our condo building. But the PIXMA was pretty huge, and it sort of dominated our office. We needed something that could be tucked away in a cabinet. Enter the Envy. In the early going, it appears to be a perfectly adequate, boring printer. Install on our iMac was dead simple, and wireless connectivity with Bonjour worked great. So... about that ink situation. I'll admit that I was VERY reticent to sign up for yet another subscription service. But we did it anyway. The plan works like this -- you don't buy ink cartridges. Ever. Instead of paying $30 for new cartridges, you sign up for a subscription at a certain page limit. I signed up for the cheapest level, at 50 pages per month for $2.99. If you go over your limit, there's a $1 charge for an additional 15 prints. Unused pages roll over month-to-month - but only up to an amount equal to your plan page limit. I think it's likely that we're going to have that 50-page max in our rollover account before too long, giving us 100 pages available at any time if we need them. One major selling point - the entire process is automated. HP monitors your printer usage, and your ink levels, over the internet. Then they send you new ink cartridges before you run out. They even include a postage-paid return package to recycle your old cartridges! 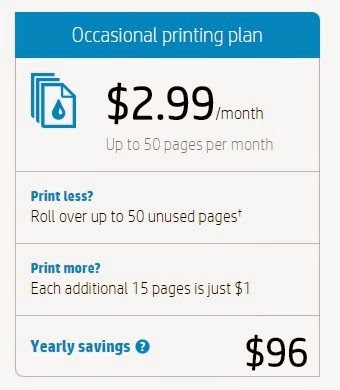 HP claims that if I used my entire 600-page annual allowance, I'd be spending as much $132 on ink. With this plan, I'll be spending $36 per year. I doubt that I'll come anywhere near 600 prints per year or $96 in savings - there's no way I've ever spent $132 on ink in a single year. But a new set of cartridges (one color, one black) typically runs us at least $45, and we run out more than once per year. HP estimates that the "break even" is at around 13 prints per month. Print at least that much, and Instant Ink is a good deal. Print less, and you may as well buy cartridges directly. Frankly, even at the breakeven point, it's worth joining Instant Ink just to save the hassle of going out to buy ink cartridges, and trying to remember which cartridge fits your printer. Finally, the subscription can be cancelled at any time. So we'll give it a shot. The HP Instant Ink program really seems to make sense at these prices. I'll report back, once we have a few months worth of usage stats to verify that assumption. UPDATE: One year later, we ran the numbers - Was it a Good Deal? Did you ever post an update to this? I searched but didn't see one...am thinking about getting a new HP printer and doing the Instant Ink along with it....after 8 months, how do you like it? Have you gotten value out of it? It's unlikely that we're getting full value.... we just haven't used the printer very often. That said, at $3/month, it will be nice to never have to buy a $30 ink cartridge. We certainly haven't hit our page limit at any point. Jamie - we finally ran an update post! I've got 14 months of data. Bottom line - I'm not getting any real savings, because the printer sits idle for months at a time, and when we DO use the printer, it's for way more than our allotment. That said, we're still running something like 10 cents/print, which isn't awful, especially considering the benefits of never having to order ink cartridges, and spreading the cost of ink out into almost-insignificant monthly payments, instead of annoying $40 once-annual payments. Called to cancel my subscription - not been working properly for months, been a long time since I received ink. Thought I was no longer enrolled in the program; checking my cc statement found I was still being billed. Called to get a refund for some of the months and leave program; was informed not only would there be no refund, I was being billed for November also. Today rcvd a msg my color cartridge would not work because it was part of your program. I am very upset about the entire situation. Wow you need to file a complaint about this. You PAID for that ink you should be able to use it. Same problem. I am no longer able to use my HP Envy, literary I am unable to print. I canceled my HP print and now can't print anything. Unbelievable. The HP Envy has a serious, un-fixable issue with connecting to wi-fi networks. Every time you want to print, you have to re-set the wi-fi connection. It's unbelievable that this printer could be released as a consumer product. We're still using it, because it's so rare that we actually print anything. But I'm watching intently for a color laser that will fit inside a PB Bedford cabinet. Same problem. I am no longer able to use my HP Envy printer, literarily I am unable to print. HP is control of my printer. I canceled my HP print and now can't print anything. Unbelievable. To be clear - is the issue local (like ours), where the computer can't find the printer? Or is this something HP is doing to you remotely, after you dropped Instant Ink? There is an Id chip inside the subscription ink. When you cancel service, they can shut off the ink cartridge. You have to buy retail cartridges without the chip in it. Had HP printer w/ insta ink was costing me $.30 a page to print. The ink dries out also. Went to CxL insta ink..printer did not work. also have insta ink cartridges left that I paid for and can't use! Maxify all in one office printer comes with full ink.. was able to print 1000 pages with ink included at $.01 a page. Canon ink cost for black xxxlarge was $31.00 for over 3000 pages. Canons ink does not dry out! Have say to Canon is a way better printer!